Speaking in public is not an easy task for the first time. For most of the people it’s anxiety to face the audience. Indeed, initially, everyone has this anxiety, but little by little by facing a group of people and talking to them you will built your confidence and reduce your anxiety. 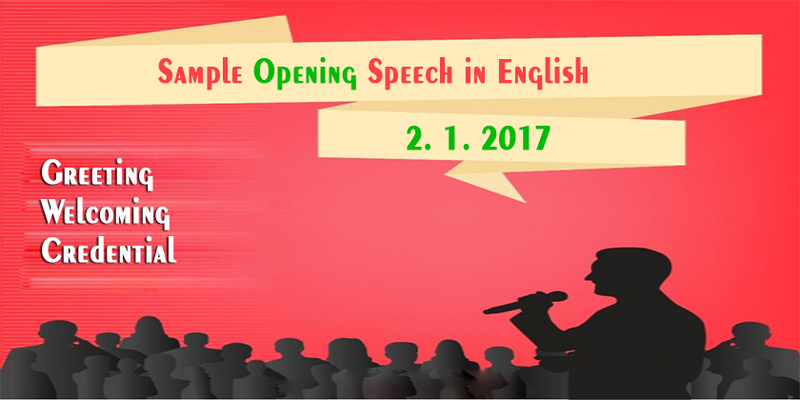 In fact, a successful speech starts from a successful and effective opening. If you have a good first impression and gain the attention of the audience, then till the end of your speech the audience will be willing to listen to you. If you’ve got the honor of preparing and delivering one, you have to know about the essential elements to cover in your opening remarks. Follow the steps below to have a marvelous opening. O Allah the Almighty protect me and guide me to your love and mercy. Ya Allah don’t deprive me from beholding your beauty, O my Lord accept this please. There is nothing in my heart except Allah. A warm good afternoon/evening/morning to all of you present here. My name is (insert your name) and I will be your host till the end of function. Step 2. Specifically acknowledge and welcome any important guests and thank them for coming. I (insert your name) on behalf of (insert the name of someone) welcome today’s special (insert the name here) to the special evening of splendor. We are delighted to have you here to participate and share in the (inset the name of the event) hosted by (insert the name of your organization). Thank you for coming. That many of you travel long distances serves to remind us all just how important our work is. Give a brief introduction of the occasion. The audience want to know what you will represent them in the whole function. You have to shortly evaluate your occasion to grab the audience attention and captivate them, why they are going to listen to you for the rest of your occasion. Convince them to be with you till the end of the function. Remember, don’t ruin it by giving too much away! Just enough to tempt and no more. Unless you’ve been requested to do otherwise, keep it brief. One to two minutes is generally sufficient. Please do rehearse. It makes a huge difference! You’ll sound, and look better. Taking the time to rehearse shows respect for yourself, the audience and the event. Truly. To find find more useful scripts about comparing or anchoring script click here.